Cinema screen grab taken from a British Documentary " World War One In Colour" made in 2003 where cars are being investigated by IMCDB. Computer colourized footage taken in World War I. 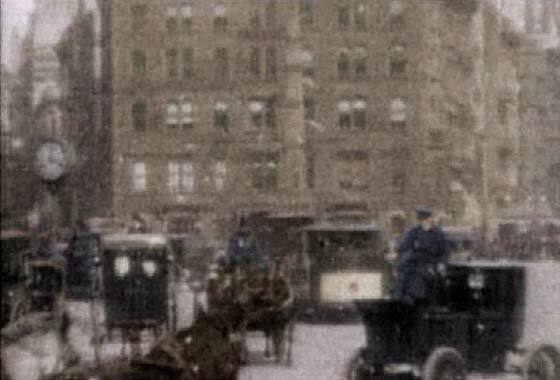 -- Fuzzy, but as driver is at roof level and is at front of the vehicle, and vehicle seems to be front wheel drive, I think this is a cca 1897 EVC (Electric Carriage & Wagon Co) Front Driving Brougham Electric Taxi. Their slightly later Square Front Brougham had the motor in the back wheels. Couple of photos received from Craig Anderson (UK?) 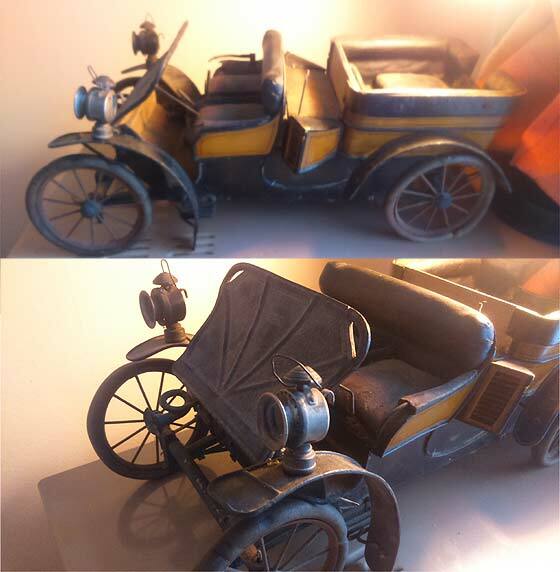 of veteran model car 1:10 scale. The car must be mid engined as it has ventral radiators behind the drivers seat. It is tiller steered. -- This is a quite unique car designed by Fredrick Lanchester in 1895 who worked from original principles rather than copying. 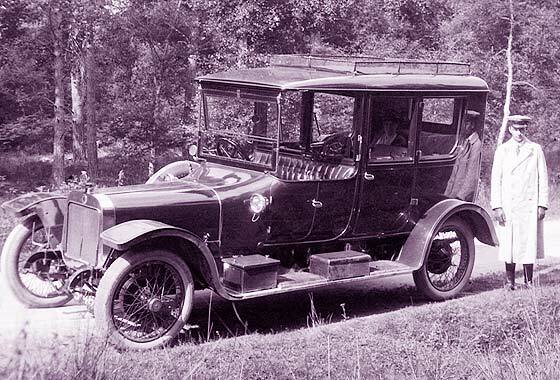 It is a cca 1903 Lanchester 12HP Rear Entrance Tonneau with a horizontally opposed twin cylinder air cooled 4032 cc engine under front seats, epicyclic gearbox, and worm drive. 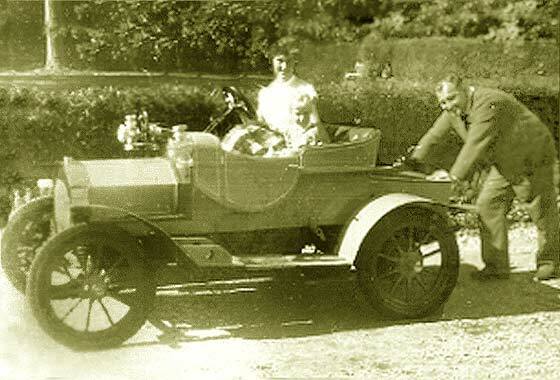 Fuzzy period photo received from Jackie Hammond (UK) tracking down her mother's cars, one recently in the Classic Car Weekly! This car was not hers but she was photographed in it at Beaulieu in 1959. -- This is a 1904 Brushmobile 6HP 2-Seater which seemks to have been used as a 'photographer's prop' at/near Beaulieu. We have traced a number of photos of different unconnected people sitting in the car. 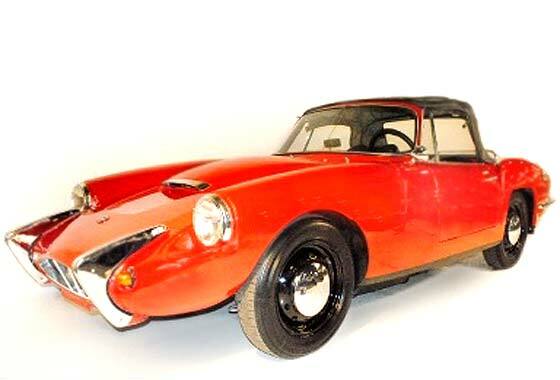 More info on this quite famous 'filmstar' car can be found at the top of Help Page 41. While surfing the net on other matters I came across this photo and saved it for future investigation thinking on the lines of it being a Daimler taxi. I have now lost the reference as to where I saw it, so cannot acknowledge the origin. -- Closer investigation confirmed definitely not a Daimler, but is a Taxi. Registration CE 305 is Cambridge County Council but no dating available. 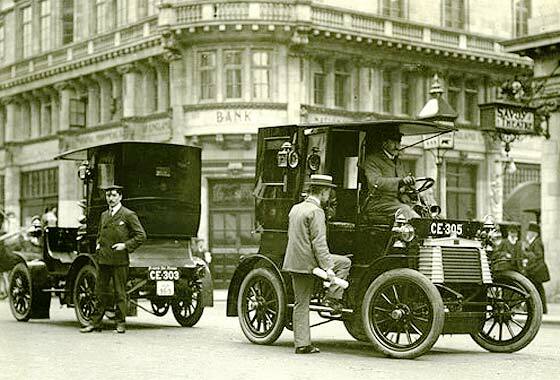 Our Ariejan Bos advises it is a cca 1905 Rational Taxi, made in Bassingborn, for London Motor Cab Co.
Puzzling photo received from Adrian Wynne-Morgan (UK) of group by their new acquisition. Harrow Weald, Middlesex, around 1908. The radiator emblem is no help as it is the original AA badge, as I'm sure you know. Hotchkiss? -- Registration taped to front axle seems to be LB 4631, London 1908/9. Car looks relatively 'used'. The AA badge is a very early one. Not Hotchkiss but our Ariejan Bos, from axle & segmented radiator with round lower corners suggests ca 1906'7 FIAT. Lovely period photo received from Linda Kane (UK) a volunteer at a local library who is putting a large postcard collection onto a database. 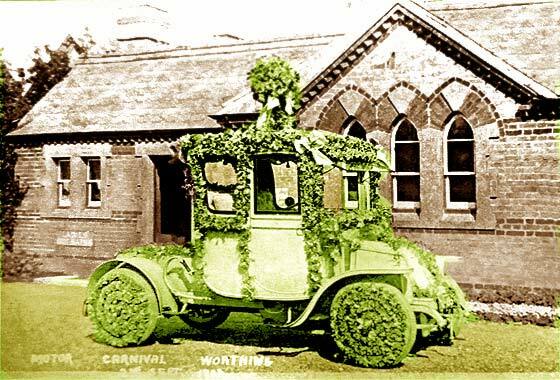 The car is dressed up for a Motor Carnival. -- First impressions of this being a two cylinder based Renault were confirmed by our Ariejan Bos who has a press cutting about this very car. It was exhibited at the Agricultural Hall Show March 1908 as a 10'14 Renault chassis with a Thrupp & Maberly 'Sedan Chair' body painted a delicate shade of green. 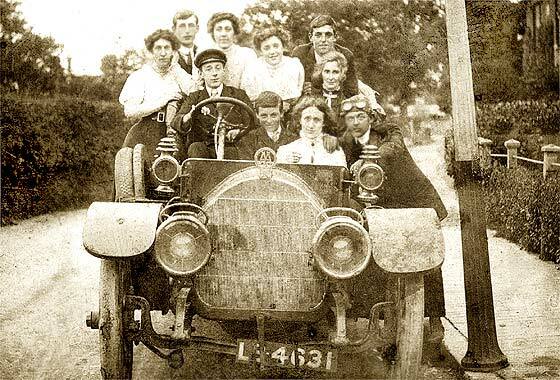 Period photo received from Geraldine Adam-Thwaite (UK) which is a scan of an unknown car requiring expert knowledge for identification. No information to impart other than found in an archive of photographs. It is on cellulose estimate date as 1910s. -- Registration is Edinburgh CBC but only two numbers visible. No dating dates available anyway. Car is Scottish made in Alexandria near Loch Lomond. Electric sidelights suggest this is cca 1913 Argyll 25'30 Streamline Limousine, open drive. Another fascinating photograph from our regular contributor Cicos Florin in Constanta by the Black Sea (Romania) who is interested in old cars of Romania. Do we know what this is? -- Interesting that this photo is on a Romanian website as being a Taxi in Brasov and also with notation of Fiat 502. It is indeed a FIAT, and it may have been a taxi, but it is a cca 1920 FIAT 505 Coupe de Ville, sometimes called an open drive limousine. Very similar car also Cicos/Romania is on Help Page 59. Lovely period photo received from David Josey of Abberley, Worcester, (UK) dated 1926 on the back, owned by Grandfather Mr T J Purkiss, builder in Southend on Sea. Believed Grandfathers first new car in the yard of his workshop in Southchurch. 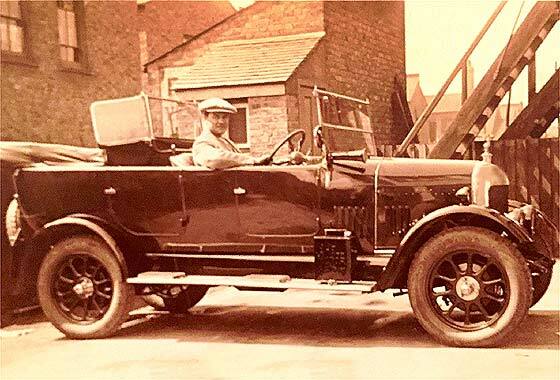 -- This is a very popular British car known as the 'Bullnose' and is the longer cca 1925 Morris Oxford 14'28 Tourer. Introduced 1923 with bigger 1802cc engine it was initially very difficult to differentiate from first MG Oxford 14'28 Cabriolet Roadster. 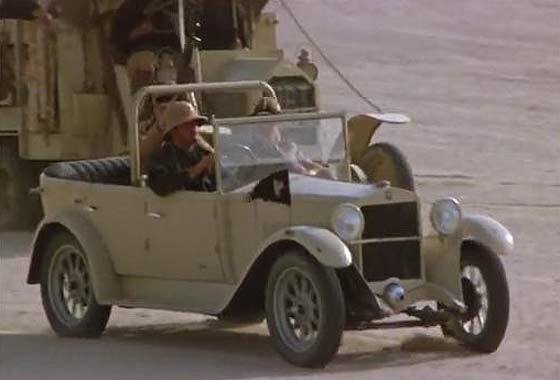 Cinema screen grab taken from an American film " Lion of the Desert" made in 1981 where cars are being investigated by IMCDB. In Fascist Italy Pre-World War II of Benito Mussolini, cruel General Rodolfo Graziani sets out to capture Omar Mukhtar and to vanquish the Arab nation in Libya; based on actual events. -- This is a cca 1926 Fiat 509S Torpedo which differs from all others by having a roll-over bar. Not difficult to guess great deal of damage was going to be inflicted on car ! Another fascinating photograph from our regular contributor Cicos Florin in Constanta by the Black Sea (Romania) who is interested in old cars of Romania. Do we know what this is? -- Another American car in Romania. Place must have been full of them. This one was made in Detroit by company founded by William Durant in 1913 who used Swiss racing driver Louis Chevrolet to promote his cars. Louis Chevrolet left company 1914! This is a cca 1926 Chevrolet Superior V Series Touring. 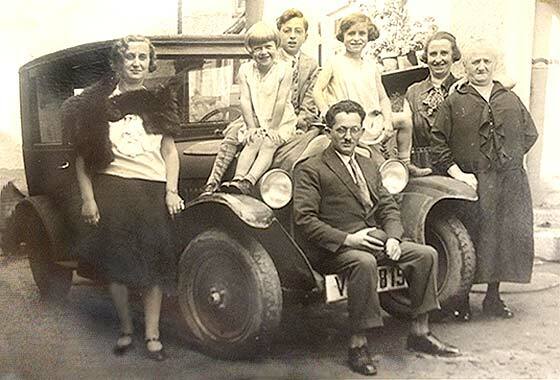 Rather distorted photo of a photo received from Greg Spitz of Aurora, Illinois (USA) saying this is his Grandfather's car in Germany in the 1930s. If we could identify the make and model that would be wonderful. -- We have attempted to correct the distortion on the photo and applied some enhancement. The car was made by the then Germany's largest car manufacturer and is a cca 1929 Opel 4'20 Limousine. That year General Motors took control and in 1931 took over. Couple of lovely period photo received from Grant & Natalie Coopes, Perth, (Australia) who are researching family history so dates would help with timelines of the people. 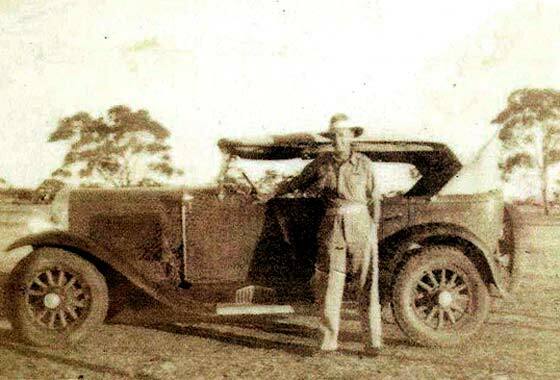 Taken in South Australia, GG Father in a newer car maybe, 1940's; a Buick? -- Yes indeed but if a new car than the timeline is way out. This is a cca 1929 Buick Model 25 Four Door Tourer. Dating is from the shape of the bonnet with pronounced crease leading to a specific radiator, and specific louvres used 1928 to 1931. 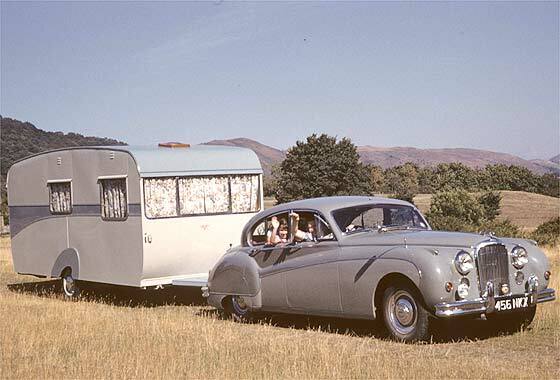 Couple of early caravanning photos received from Steve Bradley (UK) sent on behalf of Aleck Stacey, the Grandson of Aleck Stacey who later became Mayor of High Wycombe. Can you identify the cars please? Photos taken around High Wycombe. -- KX 3263 is a registration issued by Buckingham CC in 1930. From the square-ish radiator with a round badge globe logo it seems the car was previous year model. 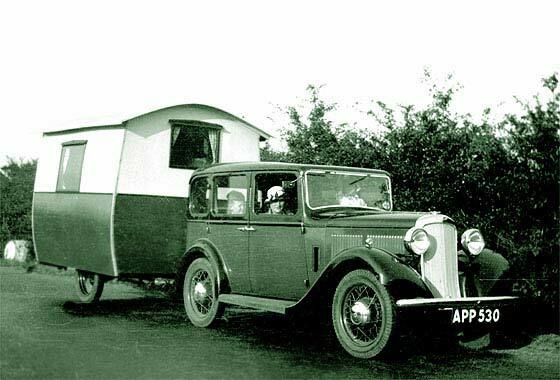 The car is a cca 1929 Triumph Super Seven Saloon, towing an Eccles Trailer Caravan. Couple of photos received from Steve Christensen (USA) who was only able to get close enough for two photos and is having a very hard time figuring out what it is. Can we help? -- Made in South Bend Indiana USA by company started by Dutch Studebecker family making wagons. Family became Studebaker and started in automobiles by building battery vehicles and making bodies for Garford; parted1911. Eventually purchased EMF 1910. 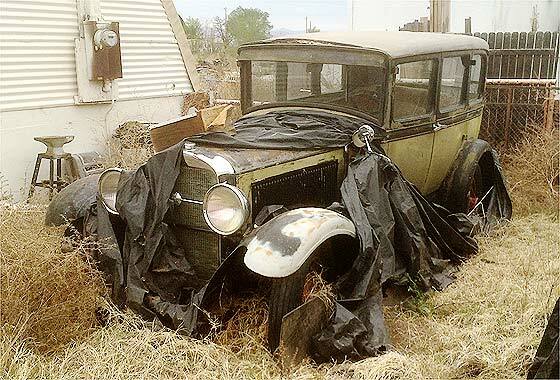 This is a cca 1929 Studebaker Commander Sedan. Cinema screen grab taken from an American film " Lion of the Desert" made in 1981 where cars are being investigated by IMCDB. 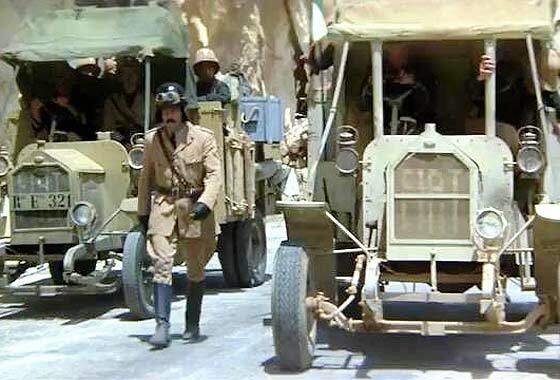 In Fascist Italy Pre-World War II of Benito Mussolini, cruel General Rodolfo Graziani sets out to capture Omar Mukhtar and to vanquish the Arab nation in Libya; based on actual events. -- But not on actual vehicles. 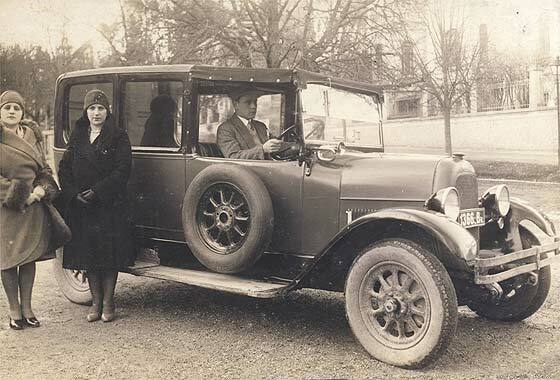 The car depicted is supposed to be a FIAT as it has a Fiat badge, but is actually an American cca 1930 Dodge DA Sedan, -with right hand drive. Cinema screen grab taken from an American film " Lion of the Desert" made in 1981 where cars are being investigated by IMCDB. In Fascist Italy Pre-World War II of Benito Mussolini, cruel General Rodolfo Graziani sets out to capture Omar Mukhtar and to vanquish the Arab nation in Libya; based on actual events. -- But not on actual vehicles. 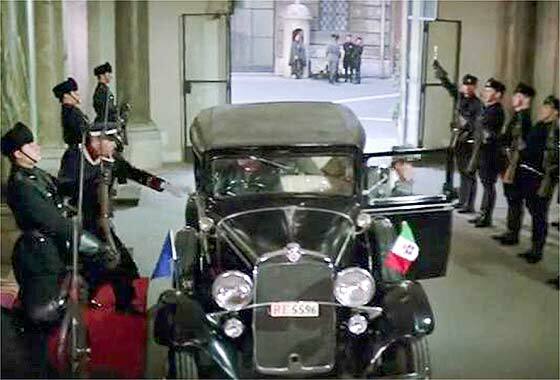 The vehicle depicted is supposed to be a FIAT, probably the 18 BL, with a Fiat badge, but these are actually made-for-movie look-alike trucks. 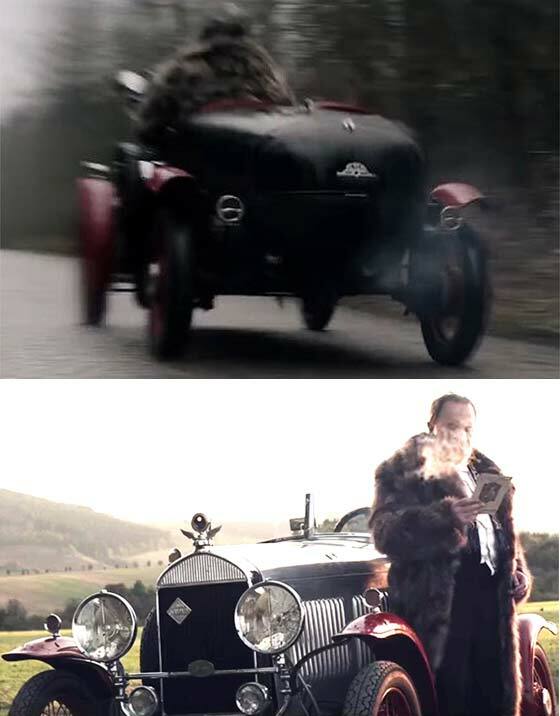 Cinema screen grab taken from a Czechoslovak Made for TV film "Každý milion dobrý" made in 2016 where cars are being investigated by IMCDB. A lady owner of a thriving business has car accident and afterwards decides to sell business to look after the needy. -- This is a cca 1931 Walter Super Six Tourer. 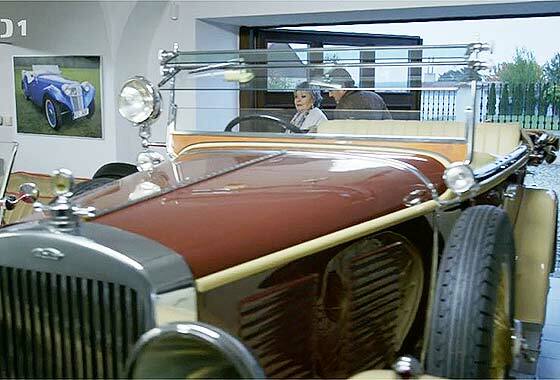 Walter started 1898 and in 1930s made the most expensive cars in Czechoslovakia. They diversified into aero engines, made jets for MIG, and currently part of General Electric. Cinema screen grab taken from a French film "Marguerite" made in 2015 where cars are being investigated by IMCDB. A wealthy woman loves to sing but is no good at it professionally. 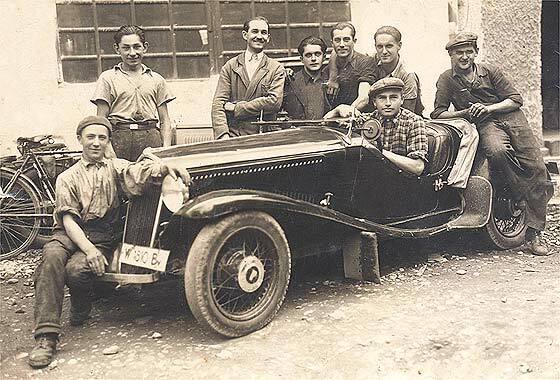 -- Very obscure car which took a lot of finding; a cca 1931 Sima Standard Sports designed by Marcel Violet of Sima Violet who sold out to Emile Dombret of Alcyon. The car was based on using Citroen and Amilcar bits, made between 1929 and 1932 using a Citroen 5CV engine, it could do 80kph. Couple of early caravanning photos received from Steve Bradley (UK) sent on behalf of Aleck Stacey, the Grandson of Aleck Stacey who later became Mayor of High Wycombe. Can you identify the cars please? Photos taken around High Wycombe. -- APP 530 is a registration issued by Buckingham CC in 1933. From the lack of a lower peak to the radiator, it seems the car was previous year model. 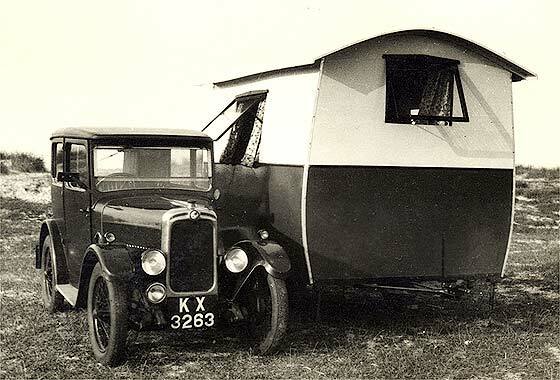 This is a cca 1933 Hillman Minx Saloon (Mk1), towing the same Eccles Trailer Caravan. Another fascinating photograph from our regular contributor Cicos Florin in Constanta by the Black Sea (Romania) who is interested in old cars of Romania. Do we know what this is? -- Bunch of happy looking men around a smart sporting car. This is a cca 1934 FIAT 508 Balilla Spider, a sports roadster. It had a 995cc four cylinder engine capable of 110kph. Variants of the Balilla type of car was also made by NSU in Germany, Simca in France, also in Czechoslovakia and Poland, 1932-37. 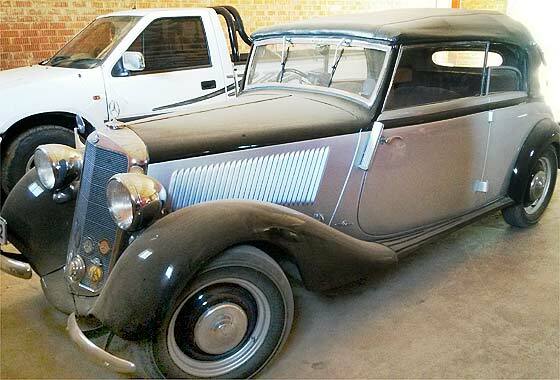 Couple of photos received from Mara Ihlenfeldt (South Africa) asking for help on a 1938 Daimler-Benz. Not a car enthusiast so no idea on car history or worth. Has tried Stuttgart Museum but no answer. -- Car on photo is cca 1938 Mercedes Benz 170V Cabriolet B. The 170 was one of Mercedes Benz best selling models in many variations. 159,000 cars were made between 1936 and 1955. The 170V was front engined and came as a two seater A and the four seater B. This is quite valuable car. Another early caravanning photo received from Steve Bradley (UK) sent on behalf of Aleck Stacey, the Grandson of Aleck Stacey who later became Mayor of High Wycombe. Can you identify the cars please? Photo taken in Portugal. Mk 8 Jaguar? -- Jaguar yes but not the MK 8. Registration 456 NKX was issued by Buckingham CC in 1960. MK 8 was only 1957/8. This is a cca 1960 Jaguar MK 9 Saloon. Same appearance to MK 8, but badging. Popular as a ceremonial car for state dignitaries. 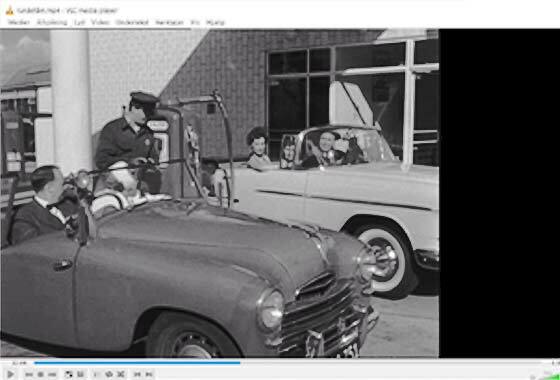 Our Tony Russell (UK) who wrote a book on Leslie Ballamy quizzed if we knew this car and the connection. -- This is a quite unique car from Autocars in Haifa, Israel, and is a cca 1963 Sabra Roadster, using a Ballamy ladder chassis and suspension. First batch was made for them by Reliant in the UK for export to USA. Ford Consul 1703cc engines, synchro, and front discs; 208 made. Reliant modified the design for the UK and sold it as 'Reliant Sabre' in 1962 with a 109 bhp Ford six 2553 cc. Puzzling photo received from Knud Jespersen (Denmark) of a car their group is trying to identify, which is a film 'still' from a Danish 1955 movie "Det var på rundetårn". -- A sports car with RHD, steeply sloping suicide doors, small windscreen with spot lamp, and external trafficators. Grille seems to have one, possibly two words in echelon. Internationally unidentified car, but actor is Miskow Makwarth whose son advised father could not drive! ; although his wife had British cars.